As it does for the rest of the Pentateuch, universal Jewish and Christian tradition attributes the authorship of the book of Numbers to Moses. Moses is the central figure within the book, and in at least two instances Numbers mentions him recording events by the Lord's commands (Numbers 33:2; 36:13). The events of the book began in the second year after the Israelites departed Egypt, as they camped at Mount Sinai around 1444 BC (Numbers 1:1). The narrative ends 38 years later “in the plains of Moab by the Jordan opposite Jericho” (36:13) in 1406 BC. 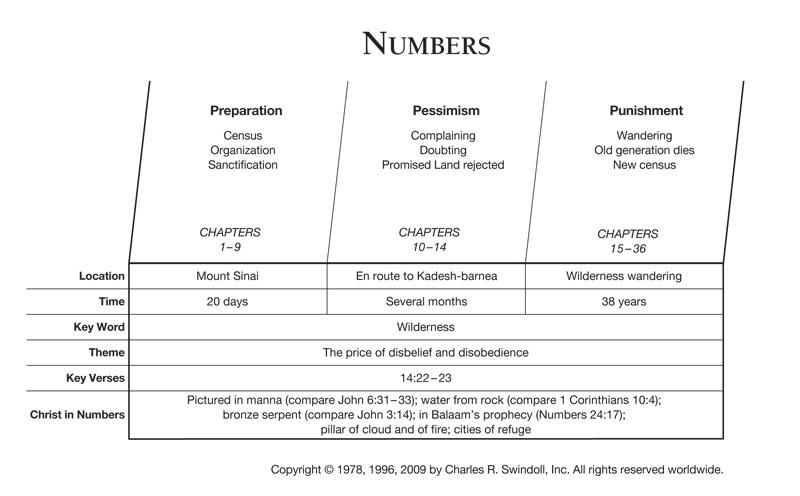 Numbers records the people's long wandering in the desert of Sinai, their time at the oasis of Kadesh-barnea, and their eventual arrival at the banks of the Jordan River across from the Promised Land. The Lord directed the message of Numbers toward the younger generation, children of the former slaves who escaped through the Red Sea. Except for Joshua, Caleb, and Moses, the older generation—everyone 20 years old or older at the time of the first census—died before the completion of Numbers, due to their disobedience and disbelief (Numbers 14:22–30). Moses completed the book before his death (Deuteronomy 31:24). WHY IS NUMBERS SO IMPORTANT? Numbers takes the reader on a long and winding path through a desert of excruciating detail. The book records census results for all 12 tribes not once, but twice; it documents priestly instructions for handling the Ark of the Covenant and the tabernacle; and it even spells out the placement of the tribes when they camped. But through it all, we cannot doubt God's unfailing direction over the nation. As a history of the nation not yet established in the land promised them long ago, this book unveils significant events sometimes referenced later in Scripture. Joshua and Caleb alone among the 12 spies encouraged Israel to take possession of the land (Numbers 13–14; Joshua 14:7); Moses struck a rock and water spouted forth (Numbers 20:11; Psalm 106:32); Moses lifted up a bronze serpent on a pole so that believing Israelites might be healed of their snake bites (Numbers 21:6-9; John 3:14); and Balaam was rebuked by his donkey (Numbers 22:21-34; Revelation 2:14). In this book, the people of Israel tested God's patience, and He in turn tested their endurance and faithfulness. Though the people failed many times, God showed His own faithfulness by His constant presence leading the way: through a cloud by day and a pillar of fire by night. More than just a history lesson, the book of Numbers reveals how God reminded Israel that He does not tolerate rebellion, complaining, and disbelief without invoking consequences. He taught His people how to walk with Him—not just with their feet through the wilderness but with their mouths in worship, hands in service, and lives as witnesses to the surrounding nations. He was their God, they were His people, and He expected them to act like it. Modern readers can take away from Numbers not only a thorough history of Israel's early days but also a renewed sense of God's delight in obedience. He is our God, too, and He wants us to live righteously, worshipping Him through our words and works. Do you see any resemblance between the grumbling, rebellious Israelites and yourself? How can you avoid following their example? With humility and sincerity, pray for a soft heart, open to God's guiding hand. 1. Eugene H. Merrill, "Numbers," The Bible Knowledge Commentary: Old Testament, ed. John F. Walvoord and Roy B. Zuck (Wheaton, Ill.: Victor Books, 1985), 215. Find resources in the book of Numbers in our resource library.